Tune noted by Annie Webb. Source: Journal of the Folk-Song Society, Vol. 2, #34, p. 134. And give a blessing to your soul beside. And in this world thou hast not long to stay. With all the gifts that our great God hath sent. Down on your knees and give the Lord thanks. Leave off your sins, and praise the Lord alway. Dressing themselves, like lawyers in a show ! As if God had not made them fine enough. And to the Judgment-seat thy soul must fly. So let your sins be ever so great or small. They must appear before the God of all. And died a cruel death upon Mount Calvary. Sheet Music from the Journal of the Folk-Song Society, Vol. 2, #34, p. 134. *Mrs. [Emma] Leather, who kindly contributes this from her collection, writes that Mr. Colcombe puts in "Oh" when he has more notes than words. Compare this tune and the words with a version in Shropshire Folk-Lore (by Charlotte Burne), which was noted from the singing of gipsies habitually wandering through Shropshire and Staffordshire. Mrs. [Emma] Leather, who communicates these words, has also collected near Weobley the words of the carol " The Black Decree," sung to a variant of this widely-spread air. 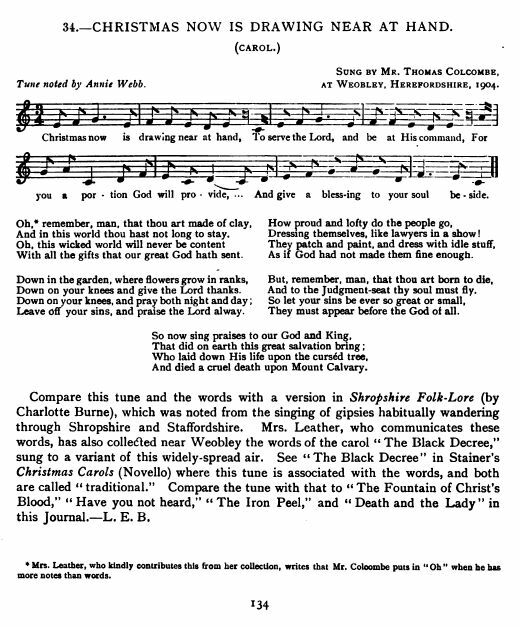 See "The Black Decree" in Stainer's Christmas Carols (Novello) where this tune is associated with the words, and both are called " traditional." 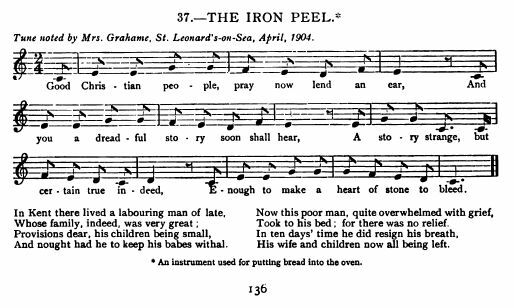 Compare the tune with that to "Fountain of Christ's Blood," " Have you not heard," " The Iron Peel," and " Death and the Lady" in this journal. -- L. E. B. "The Fountain of Christ's Blood"